SAN ANTONIO — Officials with U.S. Customs and Border Protection as well as Immigration and Customs Enforcement pointed their fingers squarely at lawmakers this week for what they call a humanitarian, operational and policy crisis at the southwestern border; this as detention facilities reach as much as 300 percent over capacity. The lack of accommodations to appropriately manage the numbers prompted ICE’s announcement Friday that, beginning Monday, the agency will house about 700 adult females at the Karnes detention facility in Karnes City, Texas. This is due to the current volume of families surrendering to U.S. Border Patrol agents at the southwest border, with ICE and CBP officials agreeing that the situation has left ICE’s “limited transportation resources” overwhelmed. The decision by ICE officials comes more than a week after CBP confirmed it was releasing immigrant families with a notice to appear due to lack of space in the detention facilities in the Rio Grande Valley sector, with El Paso, Yuma, San Diego and Del Rio, facilities ready to do the same. The strain on the immigration system itself is due to a growing number of immigrant families arriving in and around ports of entry, which CBP Chief Operating Officer John P. Sanders said will push the total number of apprehensions in March past the 100,000 mark. Sanders said of those 100,000 apprehensions expected for March, roughly 58 percent, or 58,000 will be comprised of families and another 9,000, or nearly 10 percent, will be made up of unaccompanied children. “… By any definition I cannot look at this and say that it is not a humanitarian crisis; there are other parts to this crisis… There’s the humanitarian crisis, there is the operational crisis, and of course there is the policy crisis that we’re facing in terms of the laws that need to be changed — all very important,” Sanders said. Ronald D. Vitiello, deputy director of ICE, said they’re limited in what they can do because of laws and guidelines like the Flores settlement. The Flores Settlement is an agreement put in place to protect children taken into custody at the southern border that was established more than 20 years ago as part of a class-action lawsuit first filed in 1985. Vitiello said if agents could detain the migrant families longer, that would allow for them to get their due process, including taking care of any immigration status-related issues before being released. “A fix to Flores that allows us to maintain the high standards we have for family detention, but enough capacity across the continuum in order for people to go through their due process claims — be heard,” Vitiello said. “If they have the right to asylum, that the judge adjudicates as such, then we welcome them. But if not, they’re returned. That option would require additional funding for bed space, and on the judicial end, hiring of more immigration officers to help expedite an asylum process that can currently take anywhere from six months to several years. Vitiello, who in the past has worked in the RGV sector as the chief Border Patrol agent, said there is no doubt that there’s a crisis at the U.S.-Mexico border, stating that ICE has released more than 108,000 immigrants since December 2018. “There’s absolutely an unmitigated crisis going on on the southwest border, and it’s not about how many people are being arrested. That number is significantly higher than it was just a year ago, but it’s what has happened to the people,” Vitiello said during a panel at the expo, adding that Border Patrol stations are not designed to house children regardless of how long they’re kept. With regard to ICE, Vitiello described the operational aspects of current laws as “a terrible scenario” when considering the limited resources and accommodations. 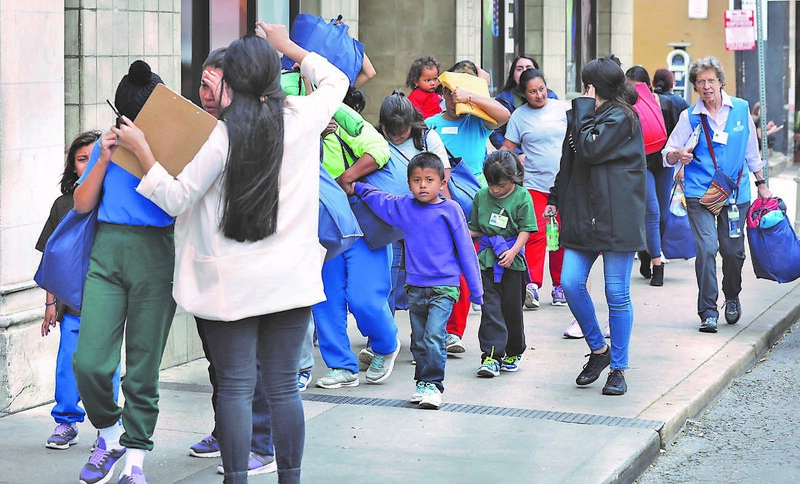 “The Flores settlement agreement and subsequent court cases that have been lost as it relates to the government — we can’t keep families in detention,” Vitiello said. “There’s not enough space. There’s not enough time for them under the terms of the agreement to have their cases heard, whether for asylum claims or removal purposes. Despite prior instances of surges in both unaccompanied minor children and families arriving at the southwest border — and most recently in 2014 when a surge of unaccompanied minor children started arriving in droves, leading to the utilization of emergency shelters in places like California, Texas and Arizona, to name a few — ICE and CBP officials said the blame lies with how the laws are currently written. Laws they say that need to be changed. In fiscal year 2014, Border Patrol agents apprehended more than 68,500 unaccompanied children who arrived at the southwest border — the highest number of apprehensions since CBP began recording that demographic in 2010. This was a more than 75 percent increase in unaccompanied minor apprehensions at the southwest border from just the year before in 2013, when agents apprehended 38,759 unaccompanied children, according to the agency’s website. In fiscal year 2019, CBP is reporting just through February, at about the half-year mark, nearly 27,000 unaccompanied children apprehensions at the southwest border — nearly half of the number of apprehensions made during the highest mark in 2014, which saw 68,500. CBP recorded the highest number of family apprehensions last year, fiscal year 2018, with 107,212 apprehensions at the southwest border — a more than 40 percent increase in family apprehensions from fiscal year 2017, when agents apprehended more than 75,000 families. This was a slight decrease from fiscal year 2016. So far this fiscal year, CBP is reporting through February that they have apprehended 136,150 families at the southwest border, which already surpasses the 2018 mark. Locally, the mayor of Brownsville said CBP conveyed to him Friday that they would release thousands of immigrants throughout Brownsville, Harlingen and McAllen over the next few days. Hidalgo County Judge Richard F. Cortez said the county would hold the federal government responsible for any “adverse consequences” resulting from the release of more than 2,000 asylum seekers thus far. CBP officials stated last Tuesday that in order to avoid a safety risk to the migrants, and their own agents due to facilities that were overcapacity, they had started releasing families from their detention facilities with a notice to appear. They were hoping to alleviate a system that was “overwhelmed” by the number of families and unaccompanied minors surrendering to agents at the southwest border. President Trump threatened via Twitter on Friday to shutdown the southwest border as early as next week if Mexico does not stop undocumented immigrants from entering the U.S.
“The DEMOCRATS have given us the weakest immigration laws anywhere in the World. Mexico has the strongest, & they make more than $100 Billion a year on the U.S. Therefore, CONGRESS MUST CHANGE OUR WEAK IMMIGRATION LAWS NOW, & Mexico must stop illegals from entering the U.S.,” Trump tweeted Friday. On Thursday, it was announced that Department of Homeland Security Secretary Kirstjen Nielsen was expected to ask Congress, as part of a legislative proposal, for more bed space, the ability to hold families past the 20-day period established by the Flores agreement, and the authority to deport unaccompanied minor children.